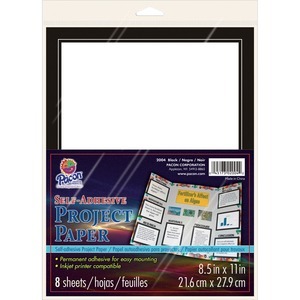 Self-adhesive project paper is a great time-saver for your display boards. You can give instant borders to your project information so no more gluing paper to paper. Simply customize presentation materials, print on an inkjet printer and stick. The adhesive is permanent for a secure hold and easy mounting. Each sheet is white with a bold, black border that has a fine white line inset to add more dimension. Sheet Size 8 1/2" x 11"